I absolutely love the fact that nail art is one of the hottest trends in fashion right now because I have always been obsessed with my nails. I’ve had long nails since I was in high school and one of my favorite things in the world is painting them with fun and interesting colors, designs or both. 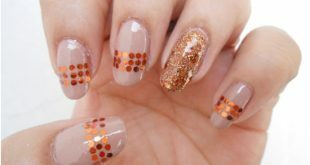 The nail are on this list is all special and unique – two factors I feel are an absolute must in creating awesome works of nail art. I’ve credited the photos to the original artist as often as possible because people really do deserve credit for some of these masterpieces. Think you can’t do these at home? Think again. There are tons of great stencils out there not to mention the tools you need to make the job easier. I’ll be talking about the tools of the trade a little more in depth in coming weeks but for now, let’s just look at some awesome nail art so you can get inspired. Ugh! How fabulous are these nails? I think what I like most about these nails is the fact that they’re so unique but still fairly simple. The colors work together and they’re attention grabbing without being too flashy. To get this look you can pick up star stencils at nearly any craft store or in the craft section at your local department store. If you’re not able to find stencils, you can make your own. Use a weighty paper and cut out the designs you want with a box cutter. 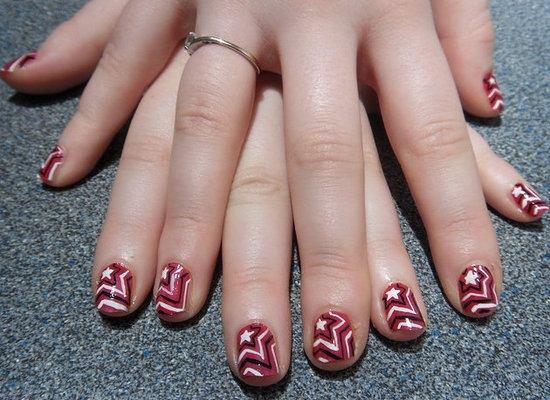 Paint your nails your base color first and then add the solid color stars. Draw the outside lines with a toothpick dipped in the color you’d like and you’re all done. Check out the original photo here. This could easily be one of my favorite nail art designs ever simply because it’s so much fun. The dots, an obvious nod to Kandinsky’s concentric circle paintings, are colorful and bright without being too loud or dramatic. This is another look you can easily do on your own but don’t feel you have to stick to these colors, although I do love them. Start with your base coat (the black polish in the photo above) and allow it to dry. Dot on a few globs of a contrasting color and allow that to dry. Finish up by dotting another color in the center of your contrast color and seal with top coat. Check out the original photo here. 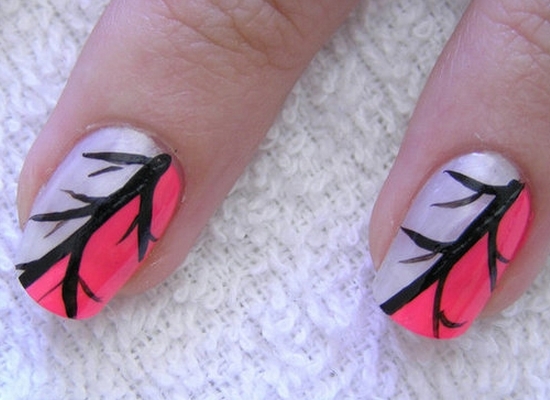 Although they’re listed as an abstract design, I look at these nails and I see trees and I like that. There’s just something about this simple yet stunning design that really appeals to me. This design can easily be done at home and with any colors you choose. Simply apply your base colors first (again, they don’t have to be pink and silver) and then paint the center with a thin black line with branches reaching outward. I’d recommend using the fat end of a toothpick dipped in black paint to get clean lines. Check out the original photo here. Another great subtle nail art look from borispumps! I absolutely love everything about this look and the best part? If you can do a french manicure, you can do this look although you’ll need to stop by the craft store to pick up a few black beads or even small black rhinestones. Start by doing a french manicure but instead of using traditional colors, you’ll be using pink, green and white. Next, add the black beads and finish with top coat. Check out the original photo here. How about one more from borispumps? I swear, I could fill an entire post from this Flickr page alone. This design is incredible – unique, interesting and fairly easy to do if you’ve got a steady hand. 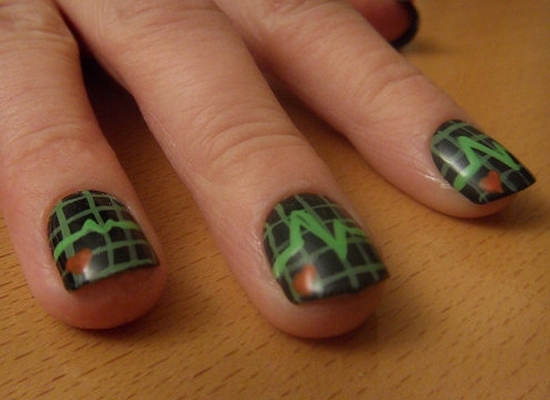 Whether you’re in medicine or simply like the design, this is a great look anyone can pull off. Just paint your nails black or charcoal and draw in the lines using a toothpick and green nail polish or a green nail polish pen. Finish off with a red heart and seal with top coat. Check out the original photo here. I don’t think words can adequately describe how much I adore these nails. They’re so bold and creative, not to mention unique. 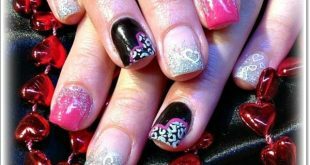 You can do nails like this at home but you will probably need to invest in a few things. First and foremost, you’ll need a bottle of holographic nail polish for the stunning background that really sets the look off. You can pick this up at most drug or department stores. You’ll also need stick-on pearlescent gems. You can buy these at any craft store. If you don’t have a craft store near you, you can also check the craft section at your local department store or buy the gems online. Start by painting your nails with the holographic polish and give them a moment to dry. 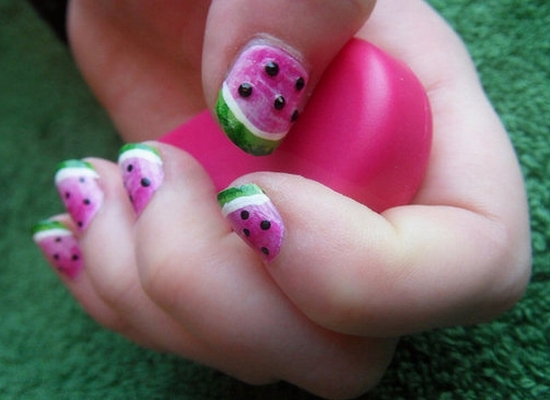 Next, peel off the gems and stick them to your nails randomly. Finish up with a few layers of top coat. Check out the original photo here. 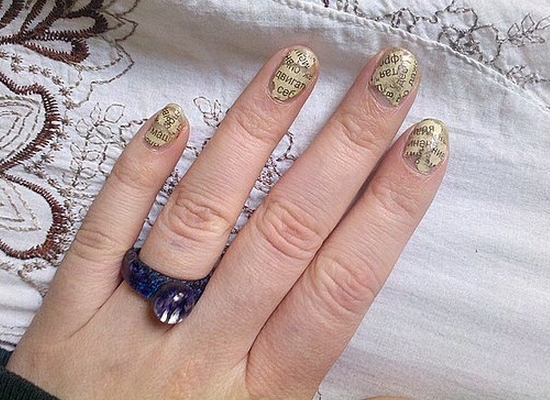 This decoupage nail art is not only stunning, it’s also fairly easy to do. All you’ll need is a little paper and a bottle of top coat. Start by ripping ten nail sized pieces of paper out of a newspaper, a book or a magazine. Paint one nail with a little top coat (you could also use nail color if you want your decoupage nail to have a color background) and put one of the pieces of paper on directly over the polish. The polish will help keep in in place. Repeat the process until all of your nails have been done. Allow them to dry then finish up with another layer of your top coat so everything stays in place and you’re all set. Check out the original photo here.